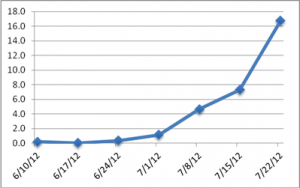 To view the full NYS IPM Weekly Field Crops Pest Report for July 26, 2012, click here. Potato leafhopper (PLH) populations are still high statewide. Many growers are spraying their fields. If the alfalfa is short and your field is over threshold, you should control PLH to avoid yield and quality losses. Short alfalfa is at higher risk for damage than taller plants. 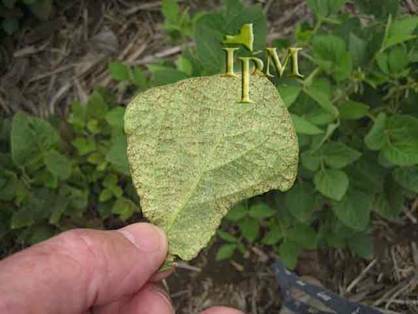 Spider mite damage to soybeans. With the hot dry weather it is bound to happen!!! Two spotted spider mites are causing problems in soybeans. Mites really proliferate and thrive when it is hot and very dry. They tend to build up along field margins as they move in from grassy field edges, ditch-banks, etc. Infestations tend to move into the field in a “V” shaped pattern, with the broader infestation along the field edge narrowing as it moves into the field. When its dry, naturally occurring fungus diseases that normally help control mites can’t develop. Red headed flea beetles are reported in soybeans this week. While they feed on leaves and can cause some defoliation these insects do not transmit virus diseases to soybeans. This flea beetle, about 1/16 inch long, is shiny black with a reddish head. To assess damage, look at the percentage of defoliation on the leaves. Midwestern states suggest that 15 to 25% defoliation by all leaf feeding insects during pod fill is an economic threshold for control. We rarely get to that point in soybeans in New York. 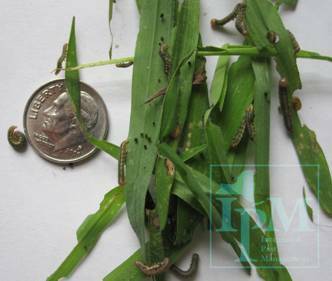 True armyworms are reported again in some grass hayfields. Their size ranges from ½ to 1 inch. 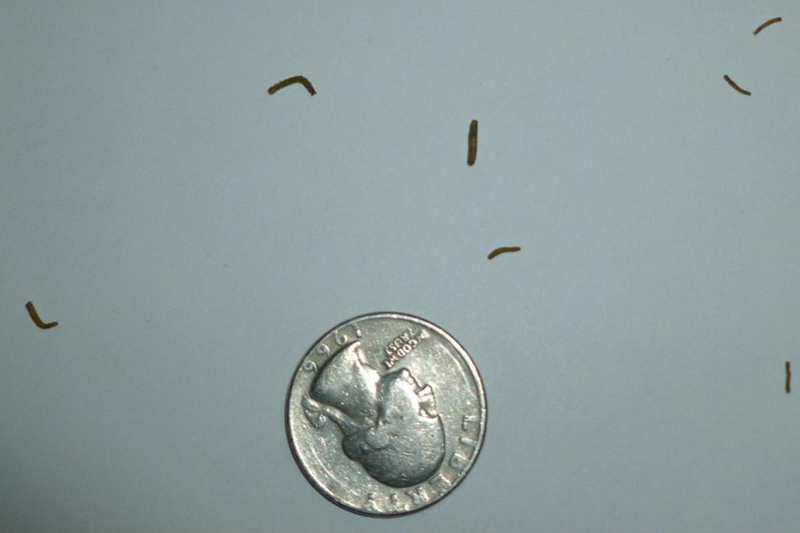 Smaller larvae (1/4 to ½ inch) can be detected using a sweep net in early morning, late afternoon or evening. As larvae get larger they go to the lower canopy or soil surface during the heat of day. If you’re out with your sweep net during the day, also check for larger larvae near the soil surface. Western bean cutworm moth captures continue. Several scouts report catching high numbers. Learn more from the “Western Bean Cutworm Update” below. I have been doing a lot of livestock pasture-fly meetings this summer, and face flies are really bugging cattle. They not only irritate cattle (with downstream effects on weight gain, milk production, etc. ), but they can vector pink eye. Producers say pink eye has been on the increase the past few years. Also, I’m starting to see horn flies on cattle. The funny thing is that stable fly numbers this summer seem low so far. Last week temperatures ranged from 0 to 3 degrees above normal for most of the state; some areas ranged 0-3 below normal. Rainfall amounts ranged widely from a trace up to 2 inches. The Base 50 growing degree-days ranged from 100 in the northern areas to 175. Warm, humid conditions have returned. Thursday’s cold front later brought more showers and thunderstorms and the possibility for severe weather. By now it should have moved out, but there is still a chance for locally heavy rainfall. Unsettled weather and scattered showers will persist. Highs will be throughout the 80s; lows will be in the 60s. Saturday will be mostly cloudy with highs in the upper 70s and low 80s. Another disturbance will bring the chance for scattered showers and thunderstorms. Overnight temperatures will be in the low to mid 60s. Sunday will be mostly sunny with temperatures in the low to mid 80s; a slight chance for a shower. Lows will be in the upper 50s to mid 60s. Monday will be sunny with highs in the 80s. Lows will be in the low to mid 60s. Tuesday will be in the 80s with mostly sunny skies, but a chance for showers. Overnight temperatures will be in the 60s. Wednesday temperatures will be in the 80s with possible scattered showers and thunderstorms. Lows will be in the mid to upper 60s. The five-day precipitation amounts will range from ¼ inch in the northernmost areas of the state, up to inches. The 8-14 day outlook is showing above normal temperatures and normal precipitation Abnormally dry and moderate drought conditions remain the same, though the upcoming rain should provide some relief. Western Bean Cutworm traps continue to attract more moths this week. A total of 955 WBC moths were caught in the 57 traps reporting this week, up from 467 WBC moths in 64 traps caught last week. Trap catches ranged from 0 to 158. Accumulated WBC moths per trap currently average 27.3 moths per trap. Overall the majority of our NY trap catch numbers are still relatively low and do not indicate any cause for concern. High counts were recorded in north and western counties: Lewis (158), St. Lawrence (123), Jefferson (74) and Wyoming (91). The large number and the condition of the moths in these traps suggests many of these moths travelled some distance and were migrants, most likely from Ontario. (Moths recently captured in NY have typically been in relatively good condition, indicating local sources). Average number of western bean cutworm moths captured per trap. Corn fields adjacent to trap locations in St. Lawrence, Lewis and Jefferson counties were checked this week for egg masses, none were found. Suspected WBC egg masses were collected in Franklin county this week. In 2010 and 2011, NY WBC numbers peaked the week of August 2. The NY WBC trapping program will continue through August. See last week’s WPR for scouting information and pictures of WBC egg masses. WPR also available in the field crops.org “blog” section. Grain bins ready to accept upcoming harvest? Monitor alfalfa seedings for weeds, insects & diseases. Check re-growth of established alfalfa stands for potato leafhopper, weed and disease problems. Consider installing biting fly traps to reduce horse, deer and stable fly populations. Note any repairs needed for recently used equipment: tractors, tillage implements, planters, sprayers, etc. as they are cleaned and serviced. Service hay harvesting equipment as needed. Last week temperatures ranged from 0 to 3 degrees above normal for most of the state, some areas ranged 0-3 below normal. Rainfall amounts ranged widely from a trace up to 2 inches. The Base 50 growing degree-days ranged from 100 in the northern areas to 175. Warm and humid conditions have returned. Temperatures will range from the 70’s in the northern portions of the state to near 90. An early passing warm front is bringing scattered showers and thunderstorms across the state. This will be followed by cold front later today, bringing more showers and thunderstorms, and the possibility for severe weather. The highest threat for severe weather is along the southern portion of the state Overnight temperatures will be in the 60’s to low 70’s with scattered showers. Friday the severe weather should have moved out, but there is still a chance for locally heavy rainfall. Unsettled weather and scattered showers will persist. Highs will be throughout the 80’s, lows will be in the 60’s. Saturday will be mostly cloudy with highs in the upper 70’s and low 80’s. Another disturbance will bring the chance for scattered showers and thunderstorms. Overnight temperatures will be in the low to mid 60’s. Sunday will be mostly sunny with temperatures in the low to mid 80’s; a slight chance for a shower. Lows will be in the upper 50’s to mid 60’s. Monday will be sunny with highs in the 80’s. Lows will be in the low to mid 60’s. Tuesday will be in the 80’s with mostly sunny skies, but a chance for showers. Overnight temperatures will be in the 60’s. Wednesday temperatures will be in the 80’s with possible scattered showers and thunderstorms. Lows will be in the mid to upper 60’s. The five-day precipitation amounts will range from ¼ of an inch, in the northern most areas of the state, up to inches. The 8-14 day out look is showing above normal temperatures and normal precipitation. Abnormally dry and moderate drought conditions remain the same, though the upcoming rain should provide some relief. The Capitol Area Ag Report for July 25, 2012 is now available online. Click here for the most recent issue. All forage contain nitrates, it only becomes a problem when there is excessive accumulation. Nitrate can accumulate in any forage species given the combination of high available soil N and cool temperatures, drought, or other stress that slows plant growth. Using urea or other ammonium forms of N as fertilizer will not solve the problem, as they are quickly converted to nitrate in the soil. With moderate to high levels of N fertilization, nitrate levels peak in grass forage about 2 to 3.5 weeks following N application. This peak is more pronounced and more persistent, as the rate of N fertilization increases. Under normal weather conditions, nitrate levels decline rapidly after peaking, but plant stress conditions may prevent this decline. Drought slows or prevents nitrate from being converted to amino acids and proteins in the plant, and can result in buildup of high levels of nitrate which can be maintained in the plant indefinitely. Nitrate toxicity is much more likely in grasses, as they are more likely to receive N fertilization. 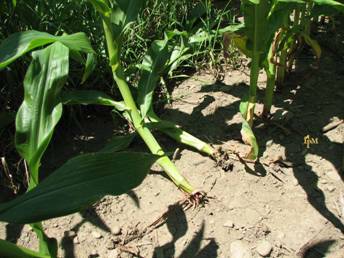 Nitrate toxicity is more likely in drought-stressed corn or sorghums that are grazed or harvested as forage. Weeds are much more likely to be higher in nitrates than crop species, so weedy fields are of more concern. Green-chopped forage carries the highest risk of nitrate toxicity. Nitrate is stable in dried forage, so dry hay can remain high in nitrate. Proper silage fermentation reduces nitrates by one-half or more, and minimizes risk from nitrate toxicity. Poor fermentation, however, may not reduce nitrates. As with most all anti-quality compounds in forages, one potential solution to the problem is dilution of the toxic forage with other feeds in the diet. Most nitrate problems can be solved by replacing one half of the high nitrate forage in the diet with another feed source. There are tests available for nitrates in forages that can be used on-farm, including quick field tests for a qualitative analysis. One of the more recently developed quantitative tests was designed to eliminate use of hazardous chemicals present in older versions of these tests (Nitrate Elimination Company, Tel. : 1-888-NITRATE, email: sales@nitrate.com). A 5-pack of nitrate tests costs about $30, and can be performed by non-skilled users in about 30 minutes. Excess nitrate in the animal is absorbed into the bloodstream. Rapid or noisy breathing, salivation, muscle tremors, weakness, diarrhea, and frequent urination are all symptoms of nitrate toxicity. Severe nitrate poisoning may cause death within a few hours after symptoms appear. Pregnant animals are much more susceptible to nitrate poisoning than non-pregnant animals. Forage with a nitrate concentration exceeding 1.5% should not be fed, even as a smaller portion of the diet. If nitrate poisoning is suspected, immediately switch animals to another forage source. Animals with moderate nitrate poisoning can be successfully treated with a methylene blue solution intravenously. 1. Delay harvest until drought has been over for a week or two. 2. Raise the cutter bar for harvest. Lower stem typically has the highest nitrate concentrations. 3. Consider making silage instead of hay or green chop. 4. Have suspected forage tested to determine whether it is necessary to dilute the forage or completely avoid feeding it. 5. Dilute high nitrate forages with a low nitrate feed source. 6. Feed a balanced ration, cattle should have access to nitrate-free water at all times. 7. Adapt cattle slowly to forage with elevated levels of nitrate. Feed forage several times a day if possible, rather than one feeding. 8. Avoid feeding green chop, particularly green chop that has heated or kept overnight. Nitrites are formed with heating and are much more toxic than nitrates. 9. Don’t overstock pastures with high nitrate forages. Heavy grazing results in consumption of lower canopy, higher nitrate fractions. 10. Feed cows before turning them out into a suspected high nitrate pasture. Cattle will adapt to higher levels of nitrate over time, if concentrations do not exceed 0.9% (9000 ppm) nitrate. 11. Observe cattle frequently if pasture is suspected to be high in nitrates. 12. Remove animals from forage source if symptoms occur, and call a veterinarian. To view the full NYS IPM Weekly Field Crops Pest Report for July 20, 2012, click here. FarmingMagazine.com (7/17/2012) Two Northern New York Cornell Cooperative Extension (CCE) Educators will receive awards at the National Association of County Agricultural Agents National Meeting in Charleston, South Carolina, July 16-19. CCE St. Lawrence Livestock Educator Betsy Hodge and CCE Lewis County Field Crops Educator Joseph Lawrence have been selected as the overall state winners from New York State. The August 2012 Issue of the Lewis County Ag Digest is now posted on our website: http://counties.cce.cornell.edu/lewis/agdigest.htm. This fact sheet describes how to manage corn that is drought stressed and provides information on estimating yields, pricing, managing nitrates and feed quality and other information. You can access the fact sheet here. The Capitol Area Ag Report for July 18, 2012 is now available online. Click here for the most recent issue. The Lewis County and NNY Weekly Crop Update for the week of July 16, 2012 can now be found on the web at: http://www.ccenny.com/index.php/field-crops/growing-season-updates/. When is My Corn Silking?